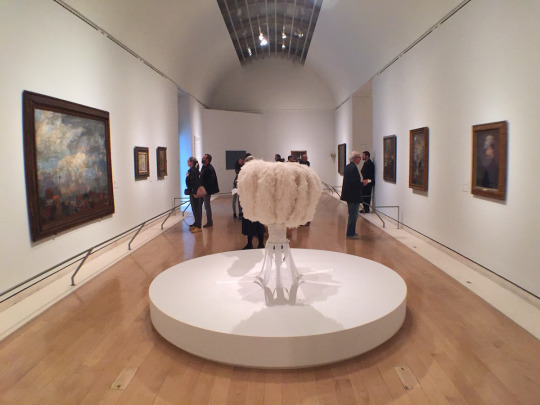 When I visited the Royal Academy’s in many ways excellent new show devoted to the Belgian Symbolist/Expressionist painter James Ensor, I was, much as I enjoyed it, haunted by an uneasy feeling. Not only that I was missing something, but that the curator, the distinguished Belgian contemporary artist Luc Tuymans, had somehow missed something too. Missed it, or averted his eyes from it. It took me some time to work out what this missing element was. To get there I had to go both backward and sideways – to Liverpool in the 1960s. 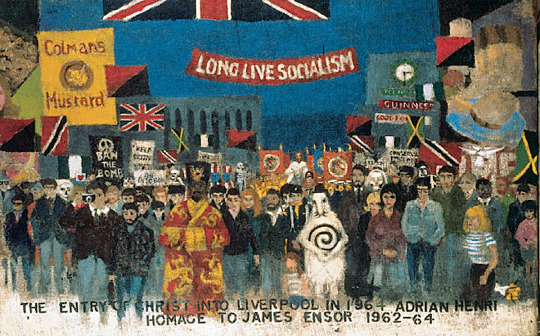 I visited Liverpool often in the 1960s and 1970s, and my best friend there was the late Adrian Henri, the chief figure in the so-called Liverpool Scene, now better remembered as a poet than he is as a painter, though painting, rather than literature, was, in fact, his chief preoccupation. 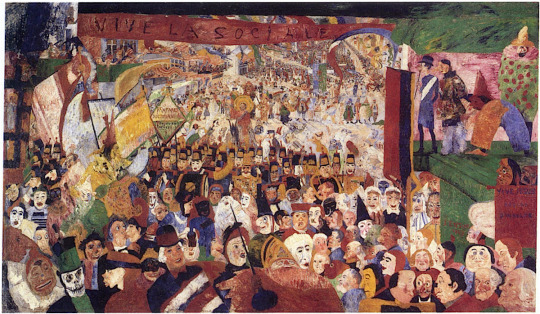 One of his most ambitious paintings, The Entry of Christ into Liverpool, dated 1962-1964, is a paraphrase of a famous Ensor, The Entry of Christ into Brussels, painted in 1889 but somewhat altered later, How this looked before the alterations are recorded in a print that Ensor made in 1895. The painting is not included in the R.A. exhibition. Somewhat ironically considering its subject matter, it now belongs to the Getty Museum in Los Angeles. The print, however, is duly present. Ensor’s Entry of Christ, even just in print form, tells one a lot more about Ensor’s politics, at an early stage of his career, that anything else you will see at the R.A. The painter is the central figure in the composition – Christ himself. The personages surrounding him, with their grimacing, mask-like faces, offer harsh criticisms of the Belgian Church and State, and of late 19th-century capitalism in general. Prominent in the front row of the marchers there is a fat grimacing bishop, wearing a mitre, with eyes hypocritically turned to heaven. The print version has a slogan at the bottom: ‘Long Live Anseele and Jesus.’ The painting, as it now is, contents itself with a banner across the top: ‘Vive la Sociale’. Anseele was Edouard Anseele (1856-1938), founder of the Belgian Workers Party, who at one time ran a weekly newspaper called The People’s Will. All of this took place long before the Russian Bolshevik Revolution of 1917. Henri’s paraphrase repeats many of these elements, though a prominent figure in the front row is now Jarry’s Père Ubu, a hero of a play first performed in Paris in 1896, and now generally seen as an important forerunner of the Dada Movement. There is also what seems to be, not a Catholic Bishop but a Russian Orthodox prelate, clad in brocade robes. In fact, the longer one spends with Ensor at the R.A. the more he comes to seem like a self-appointed Lord of Misrule, gleefully challenging accepted ideas and conventions. His use of masked figures, originally suggested by the fact that his mother ran a kind of carnival shop, selling items of this kind, is only part of the story. There is also the way in which he capriciously changes styles and genres, as for example in the caricature-like, but also child-like, The Bad Doctors, who are kuje duelists, waving a syringe and other medical paraphernalia, while Death, with his scythe, looks on. A companion to this, slightly less child-like, is called Dangerous Cooks. It shows what seem like the preparations for a cannibal feast in a posh restaurant. Prominent in the foreground is a cook carrying a platter with the artist’s own decapitated head on it. In case you miss the point, the head has a label spiked into it. It bears the two words ‘Art Ensor’. In fact, Ensor’s artistic ancestry goes back a long way – to grotesque decorations in the margins of medieval manuscripts, to German anti-Papal Renaissance prints, to Guercino’s caricatures, to Goya and to G.D. Tiepolo’s long series of prints depicting commedia del’arte punchinelli.